Here are some short videos about Placerville by SCATV-2 local Community Access TeleVision. The story of old Hangtown really begins at Coloma, where James Marshall built a sawmill on the South Fork of the American River for his employer John Sutter. On January 24, 1848, Marshall discovered flecks of gold in the tail race of the mill, and when the news spread, the great Gold Rush began. Up ravines and over hills miners and merchants, soldiers and seamen scrambled throughout the area. By the summer of '48, more than a thousand men were working the ground at the new camp, which soon placed Coloma as the initial rendezvous for the Argonauts. But not all the newcomers were interested in gathering their share of the plentiful wealth by such back-breaking labor. Murders and robberies became frequent in isolated camps along The American River, and before long, several merchants and miners had lost their poke of gold at knife point. After one such crime early in 1849, an impromptu citizens' jury met to consider the fate of the three accused. The jury wasted little time reaching a verdict. Then the question was asked, "What shall be done with them?" Someone shouted, "Hang them!" The majority were in agreement, And so it was that the first known hanging in the Mother Lode that was carried out. The site was a giant white oak in the corner of hay yard near the center of town. The word spread quickly and Old Dry Diggins soon became known as Hangtown due to several other hangings. (It was called Dry Diggins because the miners had to cart the dry soil down to the running water to wash out the gold). Today, only the tree stump remains, hidden in the cellar of a bar on Main Street in Placerville named -quite aptly - "The Hangman's Tree". By 1854, Hangtown had become the third largest town in California, surpassed only by San Francisco and Sacramento. Los Angeles was in 15th place with a mere 541 voters. With the increasing population came a temperance league, a Methodist Episcopal Church and agitation for a less morbid name. Placerville had been suggested as early as 1850. It became official when the city was incorporated in 1854. The same year, an election was held to try to wrestle the county seat of government away from Coloma, but Placerville was not the only competitor. Three other communities joined in the running. Among the rivals none could muster enough votes to upset Coloma. Two years later, Placerville tried again, and this time the contest was limited to just the two towns. Again, the official vote showed Coloma the victor, but a group of indignant Placerville citizens called a meeting to air their suspicions of ballot box stuffing and election fraud. Apparently, the evidence supporting the charges was sufficient to convince the State Legislature to settle the matter once and for all. 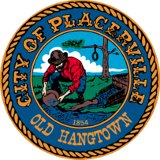 So, by an act of the Legislature, the county seat was moved to Placerville 1857. On July 6, 1856, Placerville was nearly destroyed by a fire, and as local mining declined, Placerville gained new life from the Comstock silver strike in Nevada in 1859. Throughout the 1850's Placerville had been the western terminus for the Overland Trail. The year 1859 saw the new beginning of a massive reverse migration. From 1859 to 1866, the Placerville-Carson Road (later U.S. Highway 50 was built) witnessed the greatest era of freighting and staging by horse-drawn vehicles ever known. Due to dispute with the railroad, the City of Placerville disbanded in 1873 and incorporated again in 1900. Today Placerville remains the hub of the Mother Lode. The industry has turned from mining to lumber, agriculture, light manufacturing, tourism and recreation and is famous for its vineyards and production of fine wines. Placerville remains the location of the offices of the El Dorado County government, but when the city and its rich history are recalled, it is the colorful name of Hangtown which has endured. The Bell Tower on Historic Main Street is a unique sight. Not many towns can boast of such a structure in the middle of their town. It has its own history, and in its day served a most vital and important role. It was first called "the Plaza". Placerville suffered three fires in 1856 which destroyed a good portion of the business section. The citizens realized the need for an alarm system to quickly call their volunteer fire department, so a bell was ordered from England to serve their purpose. The Tower was dismantled and moved to Cannon Hill in 1911. Cannon Hill received its name because in the early days, there was on top of the hill a National Guard Armory that had a mounted cannon in front of the building and thus the name "Cannon Hill" was given to the area. Electrical difficulties in ringing the bell from Cannon Hill resulted in the bell being moved back to the plaza in 1912. It stood there through the years until a car struck the Plaza in 1965, almost toppling over the bell. It had become somewhat shabby over the years and some were in favor of its removal. But the old timers, remembering why it was there, insisted it should be saved. Finally, in 1969, the City Council and the Placerville Fire Department voted to renovate the structure and the project was completed in 1970 with an electric siren installed to replace the new silent bell for the second time. The first electric siren was installed by the late Joseph Leonardi assisted by several linemen of the old Western States Gas and Electric Co.(later purchased by P. G. & E.) This occurred sometime between 1920 and 1921 shortly before the Ohio House burned. Along with the 1970 installation, three other sirens were installed. One near El Dorado High School and Bennett Park; one in "Upper Town"(now Broadway) near the Lutheran Church; and one on the Sacramento Street Fire House (Station No. 1). The tower has watched most of Placerville's history pass beneath it, especially in the days when the plaza was the center of life. People met beneath its bell to share the news, discuss the weather and to watch the world go by. Celebrations were big occasions in days gone by with bands, parades, dances, speeches and picnics, and they usually were centered on the Plaza. Pictures taken on Main Street on these special days show large crowds, and in the background, the Bell Tower, with glorious decorations of bunting, flags, and garlands. Even today, a long standing tradition of decorating the Bell Tower on the 4th of July remains. The only man but one. Some days later, as the postmaster pondered his dilemma, a 28-year-old Norwegian named John Thompson walked into his office. Thompson explained that his gold mining efforts had not panned out. He said he wanted to try carrying the mail over the Sierra, in winter, on his back. "I'm sorry," said the postmaster. "The contract carrier is the only one who can sign the contract over to you. And he just vanished. I don't have the authority to hire you." Thompson showed his determination by returning to the post office every morning for five days. "OK," said the postmaster. "You can give it a shot. But remember, I don't have the authority to pay you or hire you." That was good enough for Thompson. He was soon carrying sacks of letters weighing 60 to 90 pounds over the snowy peaks. Leaving Placerville (elevation 1,800 feet) every two weeks, he hiked over 8,000 vertical feet up to the Sierra summit, then down to Genoa, Nevada, near Carson City. The first half of the journey, Placerville to the peak, took two days. That was the snowshoe part. But from there it was all downhill, and Thompson could generally ski to Genoa in only one day. There the mail was picked up for points east of the Sierra. People began calling him Snowshoe Thompson. Once he carried a printing press over the mountains, section by section. Thompson carried no mosquito repellent or other personal items No sleeping bag or tent. Just beef jerky and biscuits to fuel his journey through rain, sleet or snow. Once he skied through a snarling pack of wolves having a meal on the trail. He knew that if he stopped or showed fear he would be extra calories for the hungry pack. By the time they got him to a doctor there was not much hope. "I've got to amputate to save his life," the doctor said. "But I have no chloroform." Determined to do everything possible to save this man's life, Thompson crossed the Sierra again and reached Placerville, but there was no chloroform there either. Wasting no time Thompson traveled on to Sacramento, where he finally procured a bottle of the precious chemical. He then crossed the mountains again, a lone figure bent on rescue. Because of Thompson's heroic efforts the operation was a success and the man lived. The decision in her favor not only gave to her own house in which she lived, but even another house owned by her husband. The extreme goodwill the jury gave her claims was thought be due to the fact that she was a very handsome woman. The jury was composed of mere men, one of who afterwards married her. From the Archives of the El Dorado County Museum. At the first election held in El Dorado County on September 3, 1851 Governor John Bigler received 3,072 votes and B. P. Reading 2,628. The first general election for supervisors was held in 1855. The Know Nothing party carried the party at this election. At the presidential election of 1860, the total electors for Abraham Lincoln received 2119; those for Douglas, independent democrat 2,697. It is related that when Governor Bigler visited Placerville, on a campaigning tour, he stopped at the place of a voter who was a floriculturist, and desiring to make a hit, he admired a certain white blossom, which appeared in profusion. The pretty daughter of the house smiled, and told him that the flower in question came from a bulb, and that when he was inaugurated she should send him some. True to her word she sent him, on the day he was sworn in, a peck of the handsome potatoes which have since made El Dorado County famous. The Placerville City Hall is located in what was once known as the Confidence Engine Company Building No. 1. The Confidence Engine Company wasn't Placerville's first. The first Placerville Fire company was organized June 23, 1853. Called "Neptune Hose Company #1," its motto was, "We’re Ready." The building was erected in the fall of 1860. The Placerville City Government has been located there since 1902. The building located to the east of the "Confidence Building" was W. M. Donohue & RH. Black's Confidence Building to form the current City Hall. The El Dorado Hotel burned down in one of the great fires of 1856 that leveled most of Hangtown, which by that time had become a growing Gold Rush city named Placerville. On the side of the El Dorado Hotel, the large brick Cary House Hotel was built where it still stands to this day on Placerville's Main Street. It is interesting to note that some say the owner of the Cary House recovered enough gold from under the building to pay for the cost of restoration. Like with many other events that occurred during the early days of California, there are different stories relating to the origin of Hangtown Fry, the now world famous mixture of eggs, oysters, and bacon that originated in Placerville, which was then known as "Hangtown". In 1849, just a short time after Old Dry Diggins had been renamed Hangtown in honor of the recent hanging of three desperadoes from the large oak tree on Main Street, a prospector rushed into the saloon of the El Dorado Hotel announcing that right there in town, along the banks of Hangtown Creek, he had struck it "rich" and had every reason to celebrate. Untying his leather poke from his belt, he tossed it on the bar where it landed heavily, spilling its shining contents of gold dust and nuggets. Turning to the bartender he loudly demanded, "I want you to cook me up the finest and most expensive meal in the house. I'm a rich man and I'm going to celebrate my good luck." The Bartender called to the cook and relayed the prospector's order. The cook stopped what he was doing and came out of the kitchen. Looking the prospector in the eye he said, "The most expensive things on the menu are eggs, bacon and oysters. The eggs have to be carefully packed to travel the rough road from over the coast; the bacon comes by ship round the horn from back east; and the fresh oysters we have to bring up each day on ice from the cold waters of San Francisco Bay. Take your choice. I can cook you anything you want, but it will cost you more than just a pinch of that gold dust you have there." "Scramble me up a whole mess of eggs and oysters, throw in some bacon and serve 'em up," said the prospector. "I'm starving. I've lived on nothing much more than canned beans since I got to California, and at last I can afford a real meal." The cook did just that, cooking up a whole mess of eggs, bacon and oysters for the hungry prospector. Out of that prospector's wish, and with a little artistry from the long forgotten cook, the original Hangtown Fry was created. Over the years since, Hangtown Fry has continued to have been served at many of the local restaurants in Placerville. One of the more famous places was the Blue Bell Cafe, just a few doors east of the Cary House, which proudly advertised and served the basic recipe from the late 1930s into the 1970s when the restaurant was sold. Hangtown Fry, although sometimes amended with onions, bell peppers and a minor assortment of various spices, has remained the same basic dish that was born in Gold Rush nearly a century and a half ago. It appears on hundreds of menus in restaurants along the Pacific Coast from Southern California to Canada. It is also listed prominently on the menu of the exclusive membership-only Breakfast Club at Club 21 in downtown New York City and, for a while, was featured on the first-class menu of at least one major American airline. No dish epitomizes California and its Gold Rush more than Hangtown Fry. It was created at a location central to the Gold Rush at the same time the great state was being born. And, like the miners who worked the river banks and hillsides, and the population that followed, it is a unique blend of many things, both those produced locally and those that have arrived from elsewhere. Hangtown Fry fully represents the spirit of the Gold Rush and those who helped make California what it is today. Dip the oysters in egg-wash and then breading. Pan-fry until three-fourths cooked. While doing this, fry the bacon in another skillet until just before it becomes crisp. Beat the eggs lightly. Place the bacon like railroad tracks off-center in a frying pan, pour a bit of the egg over the bacon. Place the oysters on bacon and pour the remaining eggs over. Cook and then fold the omelets over the oysters. Place a lid over it and cook until the steam blends together all the flavors. Makes 1 serving. Pat oysters dry with paper towel. Combine flour, salt and the pepper, dip oysters into the flour mixture. Melt the butter or margarine in a 10-inch skillet over medium heat. Cook oysters in butter till edges curl, about 2 minutes on each side. Beat the 6 eggs with the milk and salt. Pour into skillet with oysters. As egg mixture begins to set on bottom and sides, left and fold over. Continue cooking and folding for 4 to 5 minutes or till eggs is cooked throughout. Remove from heat. Makes 3 or 4 servings.